Have an article idea for the SUN? Send your ideas to the Editor! 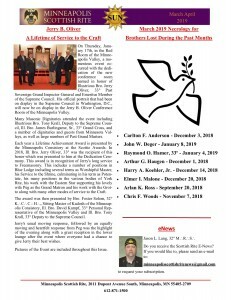 The SUN is your newsletter and is made possible by the contributions and interests of the brothers of Minneapolis Scottish Rite. Do you receive the Scottish Rite E-News? If you would like to, please send an e-mail to minneapolisscottishritenews@gmail.com to request your subscription.